Longtime Tualatin Mayor Lou Ogden trails the former legislator as votes roll in. Ogden is winning in Eastern and Southern Oregon. Hoyle is winning in the Interstate 5 corridor. 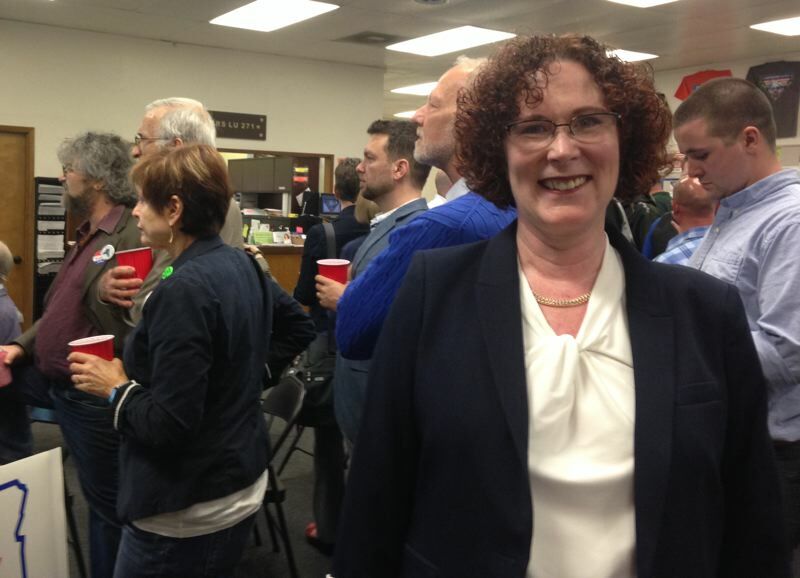 EUGENE — Former state legislator and Democratic caucus leader Val Hoyle appeared to clinch the contest for labor commissioner Tuesday evening with 51.75 percent of the votes shortly after 10:30 p.m. Tuesday, May 15. Hoyle's main challenger was Lou Ogden, the longtime mayor of Tualatin, a Republican who received 35.09 percent of the vote. A third candidate in the contest, Jack Howard, a Union County commissioner, showed 12.78 percent of the vote after a minimal campaign. Although he filed to run, he did not file the requisite fee and paperwork to be included in the statewide Voters' Pamphlet. At 10:30 p.m., the unofficial vote tally showed 491,600 votes counted in the race out of 777,774 ballots cast. Ogden made a strong showing by winning 19 counties in Eastern and Southern Oregon, but Hoyle won the nearly two dozen most populous counties in the Willamette Valley and the Interstate 5 corridor. The state's labor commissioner, who serves a four-year term, leads the Bureau of Labor and Industries, which enforces civil rights and labor laws and promotes workforce development in the state. "I'm honored that the people of this state had such faith in the message that I had," Hoyle said, which was that she would stand up for both labor and business. Hoyle's supporters gathered in Eugene Tuesday night at the headquarters of the Carpenters Local Union 271, cheering when the election returns came in. Tuesday's election capped off a brief, but bitter campaign between Hoyle and Ogden for the nonpartisan seat. In April, the Democratic Party of Oregon filed an election complaint against Ogden, alleging that the candidate misrepresented himself as the incumbent in a television ad and on his campaign signs. The secretary of state's office found that taken as a whole, neither material implied Ogden was the incumbent, and dismissed the complaint. In early May, Ogden's campaign started running an online advertisement suggesting Hoyle was friendly to the National Rifle Association in an apparent effort to dissuade liberal voters. The ad didn't mention Ogden, who has a more favorable rating from the group. Hoyle was a state representative, representing West Eugene, Bethel and Junction City, from 2009 to 2017. She served as House Majority Leader from 2012 to 2015, stepping down from that role after the 2015 session to mount an unsuccessful campaign for secretary of state. She lost the 2016 primary bid to Brad Avakian, the current labor commissioner and a fellow Democrat who, in turn, lost the general election to Republican Dennis Richardson. Avakian was initially appointed to the post in 2008 and was reelected three times. Since October 2016, Hoyle has been working at the University of Oregon's Wayne Morse Center for Law and Politics, where she has an unpaid courtesy appointment as a policy fellow working primarily with undergraduate students.